As UWGB students begin their finals next week, we encourage everyone to take study breaks. 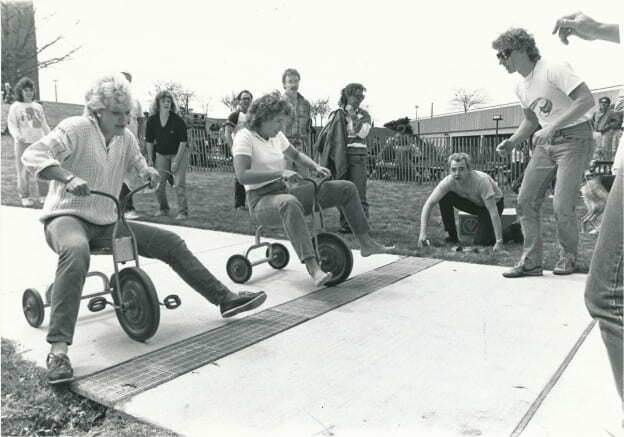 We think bringing back the tricycle races from the Spring Screamer might be a great place to start. The Spring Screamer was an annual event held during the 1980s as a stress reliever for students. What do you think should we bring this back? This content was originally posted by the UW-Green Bay Archives and Area Research Center to their facebook page on Thursday, May 7, 2015. View the original Facebook post. This entry was posted in Throwback Thursdays and tagged #tbt, finals week, Spring Screamer, Throwback Thursday on May 7, 2015 by Kimberly Vlies.